Your Own Diet Tracking Site! Offer your own private label diet tracking website and mobile web-app. 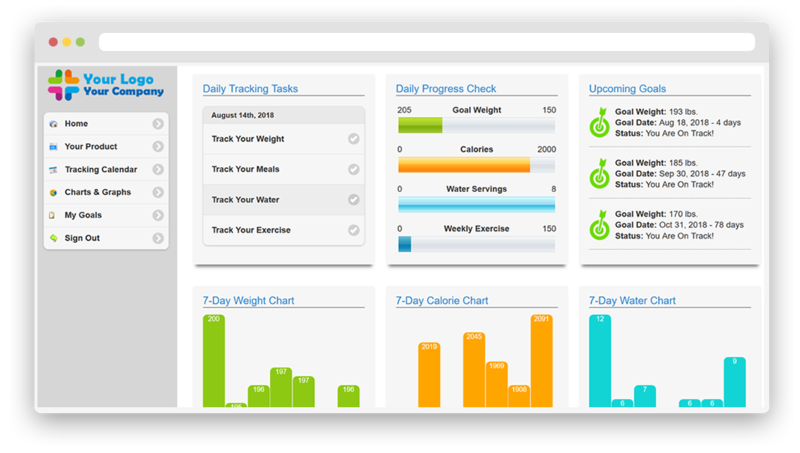 Add a custom-branded diet tracking program to your health-related website, product or service. The tracking program rocks! Developed using years of user feedback, our program is intuitive, easy to use and effective. Your users/clients will love it! We customize our program with your logo and color scheme. There are no links/references to our company. It’s your tracking program! 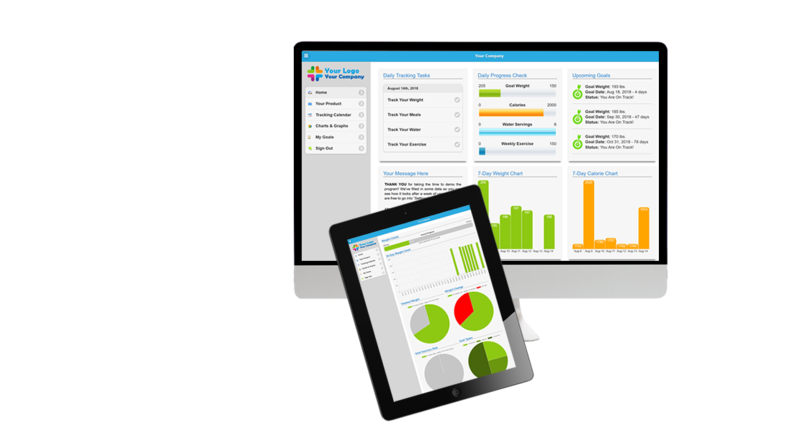 Your control panel allows you to manage your members, program access and pass along information to your community. Our program was designed for computers, tablets, and smartphones. Your icon will appear on your user's phone, giving you a unique place in their daily life! You are free to monetize the program if you wish, or include it free to add value to your existing product or service. The choice is yours! Our tracking calendar syncs up with all time-zones and allows users to switch between kg. and lbs. It can be used by anyone, worldwide! "I really love this program! It's great!" You'll be offering your users a quality ad-free tracking program that has been built using our decades of experience in this field. The end result is a clean and intuitive tracking program that reflects positively on your company. The program is so easy to use! Find the date and track your diet! Over a dozen charts spring to life, providing key information and motivation. Set your diet goals and track your progress towards them. Track your calories and look-up foods using our large database. Track your daily exercises and the calories they burn. Include your products/exercise in our database where applicable. Adjusts to any screen size and works greats in both mouse and touch modes. Users will not have to install any software to their computer or device. Your icon is placed on their devices, launches like their other apps. A. Once you sign up, we will email you a list of questions to help us customize your tracking site. After the setup is complete, usually a few hours, we will email you a link to access your new tracking site and a control panel. The control panel will contain access codes that you can distribute to people who will be using the program. Q. What if a user is no longer an active client of mine? A. Using the control panel, you can remove an active user and reuse that slot for another user. We're a perfect match for these businesses and many others! Health Website Keep visitors coming back by offering a custom tracking program. 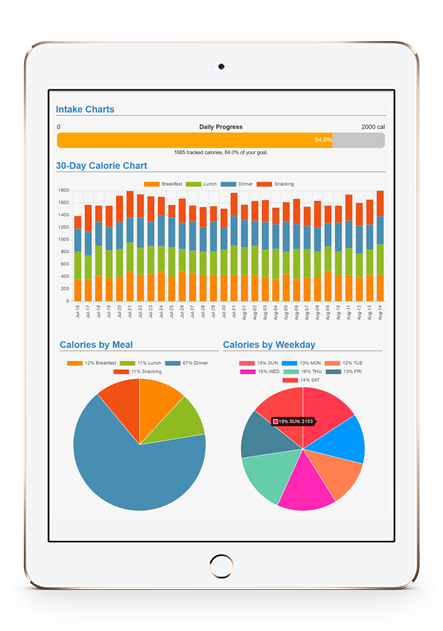 Fitness Coach Offer a tracking program that includes your foods/exercises in the database. Gym Owner Include a branded tracking program as part of your membership package. MLM Provider Include the foods/drinks/supplements you sell in our database. Business Owner Offer to employees to encourage healthy habits.